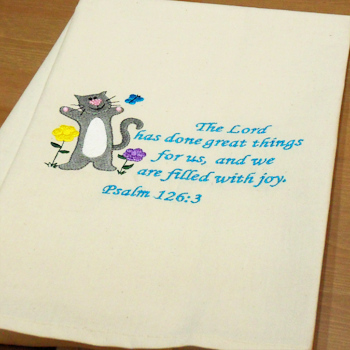 Joyful cat and flowers motif with uplifting verse from Psalm 126:3 embroidered on cotton tea towel. Joyful cat and flowers motif with uplifting verse from Psalm 126:3 embroidered on cotton tea towel. Makes a lovely gift for friends and loved ones to brighten their day with inspirational words. Cotton Tea Towel measures 52 x 72cm. Joyful cat and flowers motif with uplifting verse from Psalm 126:3 embroidered on cotton tea towel. Makes a lovely gift for friends and loved ones to brighten their day with inspirational words. Cotton Tea Towel measures 52 x 72cm. Embroidery is placed bottom half so tea towel can be folded over a oven rail. Unique one of a kind gift.